These Wrangler Women's Dark Denim FRW10DD Flame-Resistant Jeans may look just like the everyday stylish jeans you can wear anywhere -- and you can definitely wear them anywhere -- but they are far from ordinary. These flame-resistant work jeans are durable, stylish ... (see full details) (see specifications) #FRW10DD. These Wrangler Women's Dark Denim FRW10DD Flame-Resistant Jeans may look just like the everyday stylish jeans you can wear anywhere -- and you can definitely wear them anywhere -- but they are far from ordinary. These flame-resistant work jeans are durable, stylish, and comfortable -- and also provide the protection of flame-resistance. They combine timeless western denim styling with technology to deliver serious workwear with serious style. These flame-resistant denim pants for women are NFPA 2112 compliant and meet NFPA 70E, ASTM 1506 and OSHA Rule 1910.269 standards. They're rated HRC2, ATPV 15.0 CAL/CM2. They're an excellent choice whenever conditions expose you to fire or flame. And you don't have to trade protection for all the things you love about jeans. These deliver western styling, including bootcut leg openings and classic 5-pocket styling. You'll have plenty of places to stow your stuff, with two regular pockets plus a small watch or coin pocket in front and two patch pockets on the back. The back pockets feature a stylized Wrangler "W" embroidery for an extra fashion punch. The design also includes a safety orange outside ID for high visibility. The regular fit is designed to fit neither too loose or too tight. With a mid-rise, these durable work pants are made to sit just below the waist, flattering almost every body type. The zipper fly and button waist complete the classic look that never goes out of style. These flame-resistant women's work pants are manufactured in 100% cotton to give you the natural, breathable, comfortable feel that only cotton delivers. And in a denim weave, count on them to be Wrangler tough. They’re machine washable, too -- be sure to follow the care instructions. Get the flame-resistant protection you need without sacrificing durability, style, and comfort when you buy these Women's Dark Denim FRW10DD Flame Resistant Work Jeans Jeans from Working Person's Store today. 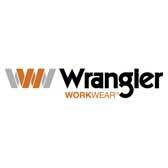 Wrangler Jeans: Women's Dark Denim FRW10DD Flame Resistant Work Jeans is being added to your cart.